50 pieces of this work of art are flying on the EUROMIR 94 mission. 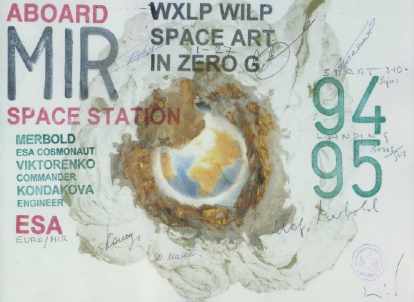 They will be stamped in space, signed by the cosmonauts and Ulf Merbold and return to Earth. A smaller size reprint signed by 24 EC Ministers of Research will be hanged in the MIR Station. It will be the first permanent work of art in space.